Improvement of the quality and quantity of chickpea seed protein can be greatly facilitated by an understanding of the genic organization and the genetic architecture of the genes encoding seed storage proteins (SSPs). The aim of this study was to provide a comprehensive analysis of the chickpea SSP genes, putative co-expressing transcription factors (TFs), and to identify a seed-specific SSP gene promoter. A genome-wide identification of SSP genes in chickpea led to the identification of 21 non-redundant SSP encoding genes located on 6 chromosomes. Phylogenetic analysis grouped SSP genes into 3 subgroups where members within the same clade demonstrated similar motif composition and intron-exon organization. Tandem duplications were identified to be the major contributors to the expansion of the SSP gene family in chickpea. Co-expression analysis revealed 14 TFs having expression profiles similar to the SSP genes that included members of important TF families that are known to regulate seed development. 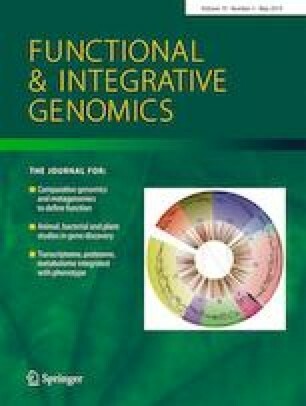 Expression analysis of SSP genes and TFs revealed significantly higher expression in late stages of seed development as well as in high seed protein content (HPC) genotypes. In silico analysis of the promoter regions of the SSP encoding genes revealed several seed-specific cis-regulatory elements such as RY repeats, ACGT motifs, CAANTG, and GCN4. A candidate promoter was analyzed for seed specificity by generating stable transgenics in Arabidopsis. Overall, this study provides a useful resource to explore the regulatory networks involved in SSP synthesis and/or accumulation for utilization in developing nutritionally improved chickpea genotypes. The online version of this article ( https://doi.org/10.1007/s10142-018-0650-8) contains supplementary material, which is available to authorized users. SV acknowledges the award of research fellowship from the Department of Biotechnology, Govt. of India. Authors thank Mr. Sandeep Yadav and Dr. Anand Sarkar for helping in microscopy, and Dr. Chandra Kant for helping in in silico expression profiling. Authors thank Dr. Swarup K Parida for the kind gift of HPC, LPC chickpea accessions. The authors are thankful to DBT-eLibrary Consortium (DeLCON) for providing access to e-resources. SV and SB were involved in the designing and execution of the work. SV majorly conducted all the experiments, lab work, analyzed data, and prepared the manuscript draft. SB corrected the manuscript and gave the final approval for the version to be published. This work was funded by the Department of Biotechnology, Government of India, under the Challenge Programme on Chickpea Functional Genomics (grant number: BT/ AGR/CG-Phase II/01/2014).